Our posters are printed on a 135gsm gloss paper in full-colour to one side, and the price shown includes delivery but is ex VAT, which will be added at checkout. 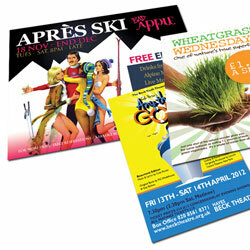 If you want to order flyers & posters together, call or email us for a package price. Paper weight may vary from 130-150gsm dependent on timescale chosen but will never be less than 130gsm. For 1 and 2-colour orders, please specify the colours you wish to use in your Item Notes box. Failure to do so may delay your job.